If you scroll down the right side of my blog you will see a list of blogs, blogs that belong to people who inspire me, and make me think, and re-think, and be creative and do what I think I sometimes can't. Dana at Old Red Barn is one of those people. She is super talented, lives a charmed life with her hubby and two beautiful girls and is one of the most generous people I have come across on the big ole world wide web. I just love this woman's blog. She's having a quilt giveaway. Ahhh quilts, just the word makes me think of comfort and home. 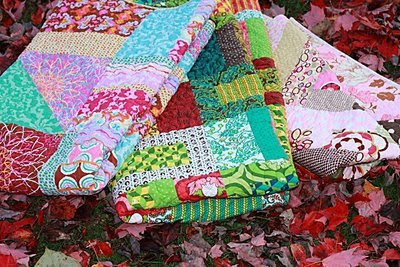 Dana's not giving away one quilt, or two quilts, oh no, she's giving away three of the most beautiful quilts you have ever laid your eyes on. If you are like me and you love quilts and would be over the moon to win one, then high tail it over there and try to win one. If you not the 'quilty' type of person, I still want you to enter so if you win you can give it to me! Good Luck! !